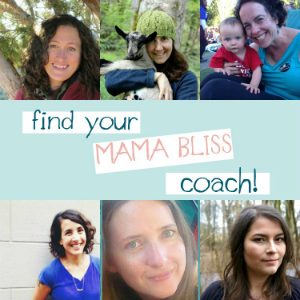 As much as you love to get to coach other moms, it can be a bit of an energy zapper at times. This even goes for if you’re in training mode. Heck – even just the researching/daydreaming phase of becoming a coach. You’re bliss levels can easily deplete. 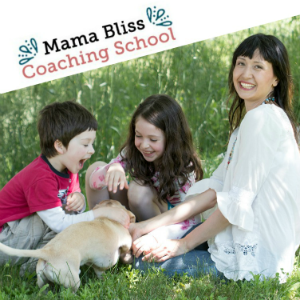 But the beauty of being a Mama Bliss Coach is that nurturing oneself first – above all else – is priority number one. While each of the four pillars of Mama Bliss supports each other in turn, the self-care piece is crucial so that your other pillars don’t tumble over each other. 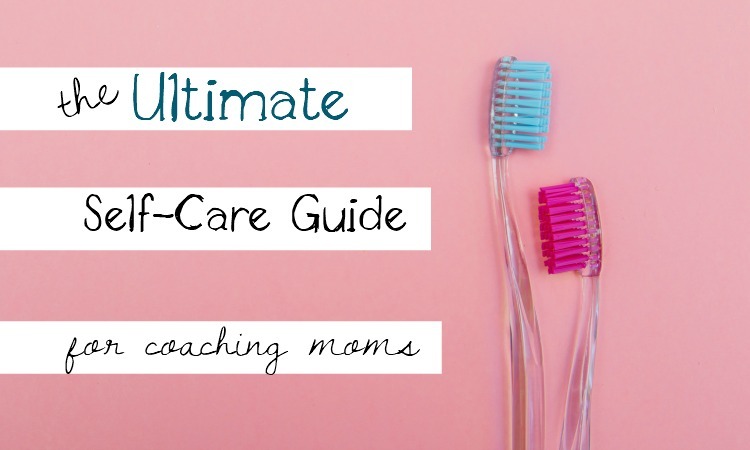 So while this is The Ultimate Guide to Self-Care for the Coaching Mama – all four of the pillars to Mama Bliss paint the holistic picture of what deeply caring for yourself, so that you can serve, will look and feel like. And to really integrate all the teachings offered here, I created a freebie to help you out with not forgetting to put your mama needs first. A simple 7 minute meditation and accompanying ritual to see you connect with your Mama Bliss, for biz or any other kind of success, once a month. 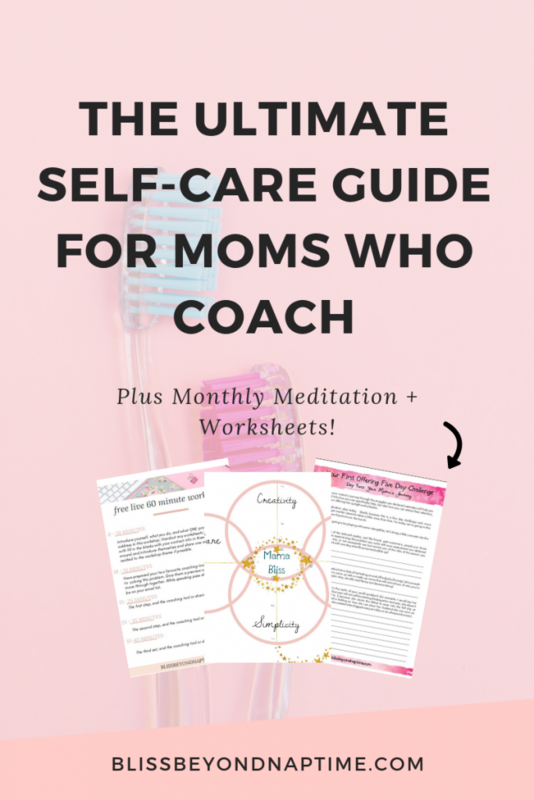 What has helped me in the past when I feel like I need to beef up my Mama Bliss reserves is to remember when the last time was that I put myself care needs to the very, very tippy-top of the priority list. I don’t know if the story rings true for you as well, but it has been the both times I was pregnant. Call the midwife because you’re still knocked up! I invite you to take that same approach and continue on with it. Because you are pregnant with another dream – your business dreams! Take on that attitude, ‘Mama needs to take care of her needs first,’ because if mama is happy, everyone else will be too. The family will quickly catch on and your clients, and not to mention your biz in general, will benefit from it too. What I have found that works for me is almost like going to a midwifery appointment. What I do now is once a year, in the fall I visit with my naturopath. Feels like having an authority figure, in that regard helps. Over the years she tells me what to do in the health realm and we now have established a relationship. She knows what’s realistic for me in terms of cutting down on my caffeine consumption. It’s just not going to happen. We both know that so we work around it. I come out of it feeling really invigorated (or maybe it’s just from the latte). I have a plan in place. If something like this would work for you, awesome. If not, become your own naturopath. Just put the reminders in of what you know you need to do and do so on a regular basis. To help make playing doctor simple for you, I have an acronym for the first pillar – self-care to share with you. SHOES. Once a month, look down and check out the state of your SHOES. Write it down in your daytimer ahead of time. Like, the first of each month, or each full moon, or each time you remember to give your son a bath (that one’s just for me). Lack of blissful sleep really messes me up and I’m sure it’s not doing you any favours too. Do what you can Mama to eventually get an extra half hour even! Get just in bed just ten minutes earlier and treat yourself to ten minutes of just-before-lights-out reading. Splurge on a brand new to you set of vintage sheets. Start a new bedtime ritual with sleep promoting herbs or essential oils involved. Passion-fruit tincture in my tea before bed was an Oprah-send. What’s doable for you today to get just even five more minutes sleep tonight or turn up the lusciousness of your sleep quality up a notch? That’s water! Had to go with the periodic time table version because SWOES would have been trickier to remember and has a depressing ring to it for some reason. Drinking more water can fix can remedy most issues. That’s the visual I share my kids. By drinking a glass of water we’re filling up our body’s toilet tank to flush all the gunk out. Still, when I get busy I forget a. forget to go to the bathroom and b. drink the delicious stuff. I’m no body fluids engineer but I wonder if there might be a correlation there. But, ironically, I always remember to treat myself to water’s dehydrating first cousin ~ latte! Fill up two large mason jars full of the stuff, keep them on the kitchen counter and take little sips throughout the day as you pass by. Drink a whole cup upon awakening to ‘shower’ your insides. If you’re vain in a mid-life crisis type way like me, imagine your skin glowing with dew and plumpness as you fill up your hot Mama-tank. What’s a Jedi mind-trick you could play on yourself in the H2O department? Oh, no, the ‘O’ word. Buying organic’s expensive but my stance is you vote with your dollars. But beyond what I’m getting at here with ‘organic’ is not only eating but living more mindfully, simply and local as possible. Consider how to surround yourself with the least amount of toxins as possible. These days there are is no escaping chemicals and heebie jeebies out there. Trust me. I tried. There are many different directions I can take off here but at a certain point I too need to shine a light on a middle path. But it’s been this way since way back when I was a kid. The best we can do is ease off the toxic burden on our system where we can. So for today, see how you can move away from poison and lean toward natural medicine that is life in its natural state. Put the family on a cleanse. Not like a maple syrup/lemonade concoction one that I was on once that I lasted about three hours on – but eating super clean for ten days. I’m talking brown rice, lots of green veggies and nothing that has more than five ingredients on the box. Nothing that comes in a box come to think of it. Toss out one or two cleaning and body products that have creepy ingredients and find a more natural alternative. Make an appointment with a naturapath, herbalist or another recommended alternative healer in your area and mention you want a simple spring tune up. What’s a slightly cleaner alternative to something your body’s communicating to you it needs a break from? A little bit everyday Mama! I was careful to at least get a decent walk in each day during my launch. It actually helps we have a dog now to make this one a non-negotiable. But its evident that without some sort of movement everyday things back up and energy stagnates and immunity drops. Move it! Sign up for a class you loved as a kid. Last year I was all over hip hop. Today, in fact, I’m calling the number I found to sign up for horse back riding! Just a couple of yummy stretches can stand in for a yoga class once in a while (try my bed yoga video or check out my five minute mama one). I discovered when I was pregnant that walking’s the best movement option ever. That and yoga and you’re set up with your own personal, at home gym wherever you go. Wear comfy shoes and, if possible, pick a destination that combines a daily task with it like walking to the mailbox, feeding ducks that live ten minutes away or grabbing a morning coffee. What can you do movement wise to celebrate this time of year for movement that was next to impossible in the season prior? Vegetating’s not just for vegetarians anymore! Stillness is the non-toxic glue that binds all the other SHOE bits together. Here we can take a deeper listen to what aspect of our self-care habits might be lacking and needing some extra attention. Not only an opportunity to observe what our body and soul’s communicating to us, with continuous pockets of stillness in our busy lives we can reacquaint ourselves with the contrast between constantly doing and simply just being. And then maybe giving a soft whisper of thanks. Love my five minute timer trick. Tell the kids Mama’s going to lie down on her bed for five minutes. Tell them when the timer goes off, you’ll get up (but really you put the timer on for ten ~ hee!). Take five minutes to meditate upon awakening and/or before bed. Five minutes! Hide if you have to. Bathroom’s a great place. Or a say you have to run out to the car for a second to grab something and then just sit there slack jawed for a few. What can you let go of for just this season to create space for more stillness? But the ultimate self-care tip that I can offer is just realizing that self-care is just one piece to the Mama Bliss puzzle. Riffing off of self-care, I encourage you to move forward with the second pillar of mama bliss, which is creativity. Ensure that you have some sort of creative outlet, i.e. a hobby or some kind of expression that you can look forward to, even just for 10 minutes a day. Moving on to the third pillar of Mama Bliss: Values. Take a look at your values periodically; the ones you want to really uphold in your business as well as in your personal life. Put the reminders around so that you can always lean on those to bring you back into a sense of purpose with your work and also get you focused on distractions out there that are not aligned with your consciously chosen values. Finally, the fourth pillar of Mama Bliss is Simplicity, which ties in all of these areas into a sweet little package so that you can really celebrate the joy of this work that you’re set out to do based on your creative play and expression. Again, all of this stems from your self-care piece. If your health succumbs (or if anyone’s in the family for that matter) there’s more at stake on the work at home mama front. Like many us, maybe you’re just freshly back from a lengthy time off to more deeply embrace school’s out for summer holidays. Or your line of work has a tendency to quiet down to a whisper in this time frame (hello, coaching). So to get unwell now, just as you’re getting your work flow back again, can really cramp your productive mama coach style. And then don’t forget to rotate your Mama Bliss tires on a seasonal basis. Shake things up a bit with a quick check in with what’s going on with your self-care practices and where you should focus your ‘let’s take care of moi’ efforts on. When my Doctor of Chinese Medicine first said this I thought she was just trying to sound more Asian than she actually is. But it’s true! The needles go in and sometimes they hurt like a mother fortune cookie. Apparently, this means that there is some blockage located at the point of needle entry. At the beginning of this back to school, and mama back to work for reals, season, I was essentially a walking block of block. The doctor advised me that instead of screaming like a five year old getting her toe nails trimmed to move the energy with my breath. And I love me anything that reminds me of contending with childbirth. To a certain extent. So when you feel some energy, or emotion, creep up, try to notice, accept and breathe through it. And use it as a reminder tool or maybe a clue as to what might be a daily or weekly self-care practice to dive into more deeply this season. For me, this translates into literally moving the feelings of worry, anxiety, sore back, with more dog walks, following his nose to the pathway systems we’re just getting to know in the the forest surrounding our new neighbourhood. Luxuriating in the calming effect nature seems to have on my nerves. A step to take this further would be to? re-adjust your work and break schedules around these subtle shifts and match up your tasks to this flow. Feeling all nostalgic for highschool recently, I played hooky! Last week, I dropped the kids off at school and deeked out to the hot springs with one of my new best friends (yay, new awesome neighbours!). Not only was my back thanking me profusely for the healing soak (and my tummy for the tacos and virgin margaritas later) but I came back super inspired from not thinking work, or kids needs, or how I wasn’t making super efficient use of my time for a whole work day. This act of not doing anything other than heeding what my soul and body were craving (in that moment it was hot liquid, a long drive in this fall beauty and sunshine) was energetically equivalent to a weekend at an all-inclusive luxury spa. But it don’t take much for this Mama to feel like a diva. Take a day off from the same old, same old and get re-inspired on how to treat yourself right once in a while. Then be sure to schedule in your winter day off three months from now once you come down from the bliss high. 3. Invest in a tune up. If there’s any time of the year to make an investment in your health – this is it. Take a moment right now and make those appointments you’ve been intending to do so for a while.? Think of it as making that appointment to get your winter tires on. Best be prepared now before the snowflakes hit the fan. Make a list of your dream team: naturapath, acupuncture, massage, homeopath- whatever healing modality you have noticed in the past you have responded well to. Or maybe you’ve just simply been curious about. One appointment might be all it takes to find that inspiration, result or at least the peace of mind that you have someone to reach out to on a holistic level when you or your family’s health gets challenged this busy, snotty time of year. These can get pricey for sure (especially once you consider the herbs, supplements or dietary shifts that are often recommended) but sometimes sliding scales are available or there are schools around that offer student practitioner rates. And below you can sign up for your Monthly Mama Bliss Recharge. It’s a meditation that only takes seven minutes and it will move you through these four pillars and it includes what I call the Flower of Mama Bliss. It’s a pretty little poster that you can fill in and hang up, quite simply reminding you of how you are going to take care of yourself on all levels, every month. And here again is where to plunk in your email address to pick up your Mama Bliss Recharge. Remember to do that now, then do the meditation once a month, Mama!